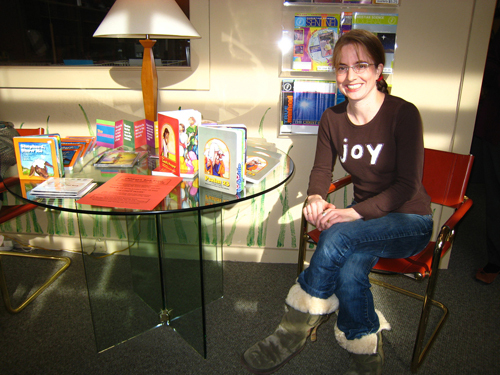 Kristin Joy Pratt-Serafini is an award-winning author and illustrator. She loves visiting schools and sharing her inspiring story of publishing her first book when she was only 16 years old with children. Kids love it when Kristin comes for an author visit! If you would like to arrange for an author visit for your school or organization, please fill out Kristin's Author Visit Request Form for more information. As many couples do, my husband Gabriel and I alternate spending the holidays with one side of the family and then the other. This year we celebrated Thanksgiving with my family here in St. Louis, MO and Christmas with his family in Orinda, CA. Since The Lord’s Prayer, (my newest book with the Christian Science Publishing Society) had just been released, my mother-in-law kindly set up a signing for me at her local Christian Science Reading Room, which is a kind of Christian bookstore/study center. It was a perfect place to have a festive Christmas event. I sold a bunch of books, and lots of kids came by. I read to them, and they colored some wonderful pictures. There were also cookies and hot cider. Thanks for organizing this event, Anna Lisa!